Steven Buck, deputy commissioners at the Oklahoma Department of Mental Health and Substance Abuse Services (center), and Michael Brose, executive director of Mental Health Association Oklahoma (right), take questions from the audience and Oklahoma Watch Executive Editor David Fritze (left) onTuesday night. Lack of funding and access to services and lack of political will have prevented many Oklahomans with mental illness and addiction problems from getting the help they need, leaders in the field told an Oklahoma City audience Tuesday night. 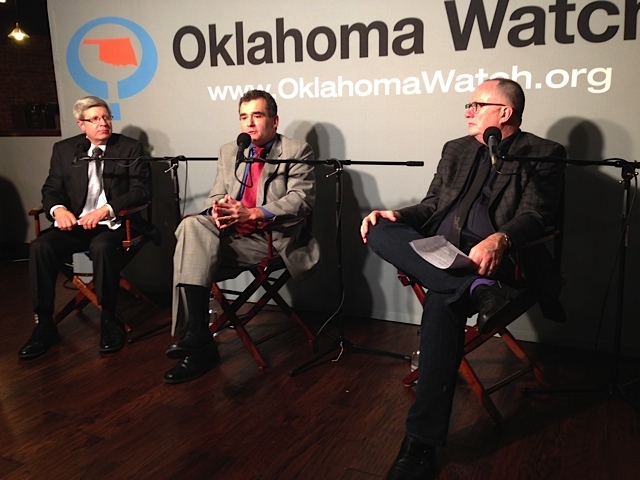 Steven Buck, deputy commissioner for the Oklahoma Department of Mental Health and Substance Abuse Services, and Michael Brose, executive director of Mental Health Association Oklahoma, fielded questions at an “Oklahoma Watch-Out” forum, sponsored by Oklahoma Watch at Kamps 1910 Café. About 50 attended. Buck and Brose spoke about a wide range of mental-health topics, including funding, early intervention, prison inmates with mental illness, a lack of affordable providers, and an innovative program in San Antonio that diverts mentally ill people from the criminal justice system into treatment. When the topic of competing needs for state funding came up, Buck said a strong case to be made for mental health is that it is intertwined closely with other state-funded services, such as education, child welfare, economic development and the criminal justice system. Brose said that how government funds are used is as important as how much is provided. He said there has been a lot of “downstream” investment in dealing with mental illness, such as spending on incarceration, but more “upstream,” or preventative, investment is needed. For those in the criminal justice system, such as recently released prisoners, it is important to make sure that those individuals get treatment and services that not only help them transition back into society, but address underlying substance abuse or mental health issues, Buck said. “For those who come back out, we have an obligation to make sure those services are there to keep them from recidivating and going back into the system,” Buck said. Brose said he recently spoke with a San Antonio police officer involved in the city’s efforts to divert those with mental illness and addiction problems. The officer told him that the program has put strain on the treatment and mental health system. Several members of the audience brought up last year’s incident in which a man ran his car into the Ten Commandments monument at the State Capitol. Brose said this proved to be an example of how law enforcement and the mental health community can work together to ensure better outcomes for people. The man, who was suffering from mental illness, was diverted into treatment and is now back in his community, Brose said. Buck said he believes great strides have been made in lessening the stigma against mental illness that often prevents people from seeking treatment. But more work needs to be done, he said. “We’re not there yet, but we’re becoming more comfortable talking about these circumstances and illnesses than we were two short decades ago,” Buck said. Brose said his organization employs several former offenders, not purely out of kindness, but because they are good workers. However, getting access to nearby mental health and substance abuse services can often be tricky for individuals, Buck said. The forum was part of a year-long Oklahoma Watch project entitled, “Troubled State: A Series on Mental Health in Oklahoma,” which is funded in part with grants from the Anne and Henry Zarrow Foundation and Zarrow Families Foundation. This Q&A forum on mental health features Steven Buck, deputy commissioner of the Department of Mental Health and Substance Abuse Services, and Michael Brose, executive director of Mental Health Association Oklahoma.